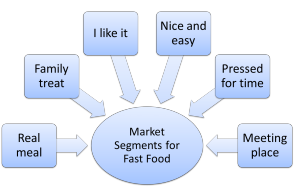 In this example of market segmentation for fast food benefit segmentation approach has been used. Generally there is a health perception that fast food is not always good for you and that it should be consumed in moderation. However, despite this perception, fast food outlets are quite popular and dominate a large share of the eat-out-of-home market. 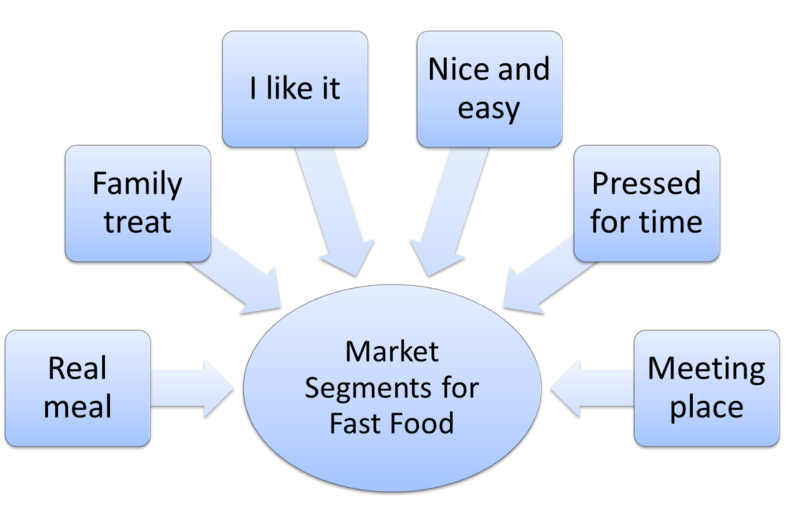 The first market segment essentially looks at fast food as a “reward” for good behavior or as a special treat for the family. Obviously consumers in this market segment are making family decisions as a household unit – not as individual consumers. In terms of it being a reward, it would not be uncommon for parents to say to their young children, “you be good today and we will go to McDonald’s (or wherever) later”. And in terms of a special treat, usually a fast food outlet is a more popular choice among family members of all ages, as opposed to a more formal restaurant. Therefore, this market segment is typically looking for: a good choice of food options (for all ages), tasty and easy to eat food, comfortable and clean facilities, fast service, easy ordering and perhaps even a playground. Because they are buying for several people in their family at the one time, good value is also important to them. This consumer segment will consume fast food primarily for the taste of it – that is, they simply enjoy it. They are more likely to be heavy users and most likely brand loyal to 2-3 different fast food chains. As they are attracted by taste, consistency of product is important, as well as new flavor varieties of their preferred product choices. These consumers are also relatively impulsive and will be responsive to advertising, in-store displays, external signage and various sales promotions. Another market segment views fast food as an easy option for food. These consumers are not necessarily lazy, but are not always in the mood to grocery shop and cook. They are consumers that don’t tend to pre-plan their weekly meals, so a fast food solution is attractive to them at times. Clearly these consumers are seeking the benefit of convenience. As a result, this market segment will seek out local outlets (or chains with lots of outlets), chains with easy service options (such as a drive-through) and a fast ordering system. They are not overly price sensitive as they see value in the convenience and the time saving. They would be less responsive to advertising focusing on the products. This example market segment is quite time poor, either in general or at a particular point in time. Their preference is NOT to consume fast food, but it may be a necessity at times. For example, if they have worked back late, or they are on a holiday road trip, or they are having a particularly busy day in general. In simple terms, these consumers are attracted to the “fast” part of fast food. This market segment would be light users of fast food and not overly responsive to sales promotions or advertising. They would also have limited brand loyalty as they will make their purchase decision based upon convenience factors only. Therefore, fast food chains with lots of outlets, drive-through options and fast service, will obtain the greatest share of this target market. This segment of consumers is seeking the convenience benefits of fast food, but they are looking for a relatively healthy food option as well. As consumers they would be lighter users of fast food and more willing to cook at home or take the time to eat at more formal restaurants. Some consumers in this segment do not perceive that all fast food chains have a product solution that meets their needs of a higher quality menu item that is relatively healthy. But this is still an emerging segment with a number of fast food operators developing products for this segment. The final market segment in this example is not interested in the food to much extent, instead they are attracted by the location and facilities of the fast food outlet and use the venue as a meeting place (either socially or for business). Some larger fast food chains have locations that are quite prominent and easy to find, as well as having a choice of seating and tables. This combination of position and in-store facilities lends itself to social groups and small business meetings. Of course, most people will buy some food and/or drink while they are in the store. This segment would be quite loyal to brands that are known for their in-store facilities and have a choice of easy-to-find locations. This segment would represent a stable and consistent customer base that while being low-level purchasers are less likely to be overly price sensitive.